Dynamic Security, Inc. is a leader in the Security Industry, forging ahead by fostering unprecedented communications between management and clients. But Dynamic doesn't stop there. We have built an infrastructure large enough to support any client, yet focused enough to allow local managers to make immediate decisions and make changes to your service quickly. This allows our company to adjust to your changing needs rapidly and efficiently. Review our many service options below, which are covered by three focus areas. Then contact a Dynamic Security Sales Team member for a personal review of how Dynamic Security can help you reach your contract security objectives. The Dynamic Team would be excited to communicate with you about your Security or Staffing needs. We encourage you to contact a member of our team, and allow us to put together a customized proposal for service for your company or organization. Dynamic Security Inc. maintains a highly trained and supervised team of security officers. This allows a reliably quick response from operational management. We reinforce those operations with quality assurance programs which ensure sustained levels of superior service. The service you receive depends upon the reliability, trustworthiness, and performance of individual officers. Each officer at Dynamic Security, Inc. is extensively interviewed, screened, investigated and tested prior to any employment offer to enhance the quality of our employee base. Once employed, officers are thoroughly trained on an initial and recurrent basis. The fact that Dynamic Security's benefits program is one of the most comprehensive in the security industry parallels the fact that we have one of the industry's highest employee retention rates. Dynamic Security, Inc. has implemented two levels of operational management to provide the experience you want and the high standard of security you need. Local managers, who undergo comprehensive management training programs and continuing education, maintain the highest levels of professionalism in the officers they supervise through regular site visits and routine tests. Managers are also afforded a high degree of autonomy in emergency situations to provide a quicker reaction time when it is needed the most. As more organizations begin hosting special events, security services are obviously factored into the equation. Dynamic Security, Inc. provides a scope of services including stadium coverage, crowd control, strike management, and other security operations for our clients during planned and emergency events. 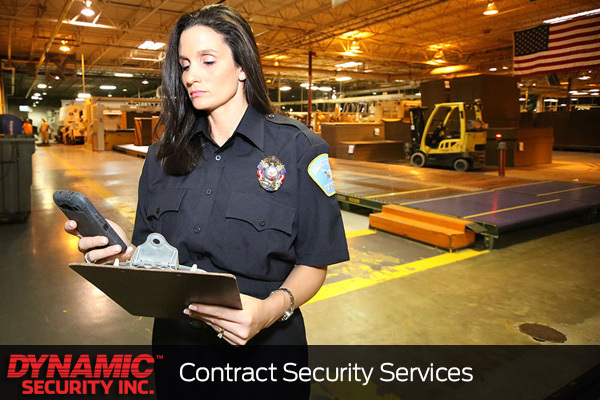 Dynamic Security's commitment to our clients is demonstrated through our stringent, five-phase quality control program. This program, which is evaluated annually, is implemented to ensure the highest levels of service through the duration of the relationship. Dynamic continues its commitment to service through its state of the art administrative system that provides accurate scheduling, time collection, payroll and billing. Other training may include CPR, First Aid, and AED upon client specific needs. 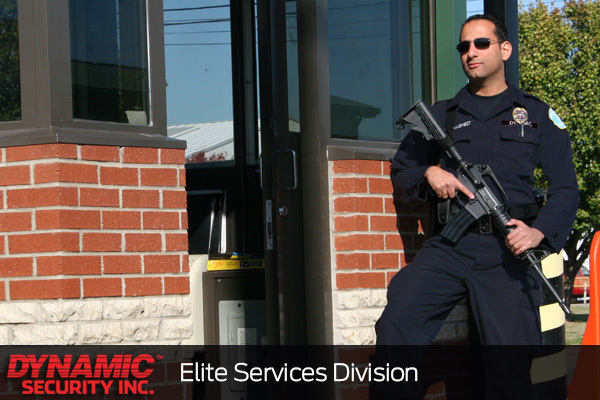 Dynamic’s Elite Services Division is set apart from the typical armed services provider as the program mirrors most law enforcement agencies in the standardization of weapons, duty gear, uniforms, and training. Our extensive selection of officers and “grow our own” training philosophy results in a group of security professionals who exceed industry standards and truly deserve the title of “Elite”! Dynamic Security Incorporated holds the credentials to meet virtually any security requirement in the Continental United States. The talent represented in Dynamic’s management spans a broad spectrum including career Contract Security Leaders, representatives from every division of Military Service, the Federal Bureau of Investigation and Law Enforcement. The far reaching experience of Dynamic’s Team also includes personnel from the intelligence community with experience in anti-terrorism initiatives, FSO’s seasoned in fulfilling the requirements of NISP and complying with Department of Defense mandates, routinely interfacing with DMDC protocols. Solidifying experienced leadership with instruction and training, many members of the team have also elected to pursue advanced degrees relevant to their field. With the expertise described above, Dynamic has established in-house professional training schools, which cover a wide variety of topics including, but not limited to; Red Cross training (CPR, First Aid, First Responder), NRA weapons training, Secondary Use of Force, DSS required training (where appropriate), MARSEC and specific state regulated training. SBA PARTNERS: Established 8(a), HUBZone, Woman-Owned, Disabled Veteran owned, small business partners to meet all small business goals. FACILITY CLEARANCE: Dynamic Security, Inc. currently holds the requisite clearance needed in order to serve our current federal DOD contractor and state Military Department clients. Existing agreements with partner organizations offer up- graded clearances and Small Business set aside compliance. CAPABILITY STATEMENT: To review Dynamic Security's complete Capability Statement, click here. The Dynamic Team would be excited to communicate with you about your Security or Staffing needs. We encourage you to contact a member of our team, and allow us to put together a customized proposal for service for your company or organization.